The easiest way to wear your scarf is probably to drape it around your neck and shoulders. This combination is perfect for long and light scarves with prints and patterns that can decorate a plain colored outfit. Wear it in an easychic outfits such as this one, with neutral nuances and earthy tones such as beige and black, to give a touch of color to the whole outfit. This way of wearing your scarf is perfect for experimenting with layers and mixing textiles, prints and patterns. Simply tuck your scarf under your belt, and leave it flowy upon your top or coat. It’s perfect not only for winter, throwing it on your coat with a maxi belt, but also for mid-seasons, such as spring or autumn, to show off your new printed scarf giving a pop of color to your basic outfit. If you want to choose something a bit more fresh and young, try this look directly inspired from “Rosie the Riveter” and the fifties! Perfect if you want to experiment new hairstyles or if you just want to wear something different; match a colorful scarf with you hair, trying light and pastel colors with dark hair or stronger prints if you have light hair. Check here if you’re wondering how hard it is to turn you scarf into a headband? This look is very elegant and perfect for special occasions during cold times: the printed scarf goes perfectly with plain colors in the rest of the outfit, such as plain yellow pencil skirt and the black top. It’s very easy, just tie your scarf onto your waist with a very simple knot: this is also very useful to shape oversize things. Go for bold and strong prints full of colors to look as stylish as possible! This is probably the easiest knot you could tie your scarf in: perfect if you don’t have time to think about it or if you’re in a rush, you just have to throw the scarf around your neck and tie it in a simple knot on the front. You can make it either high, near the neck, or down low; either way it will look just as fashionable and stylish as if you were wearing your scarf in a much complex knot! This style is perfect for work and daytime, use a colorful Hermes style scarf to make the most of it. The blanket scarf style is perfect for winter: you can just cover up yourself totally while keeping it fashion and up-to-date. 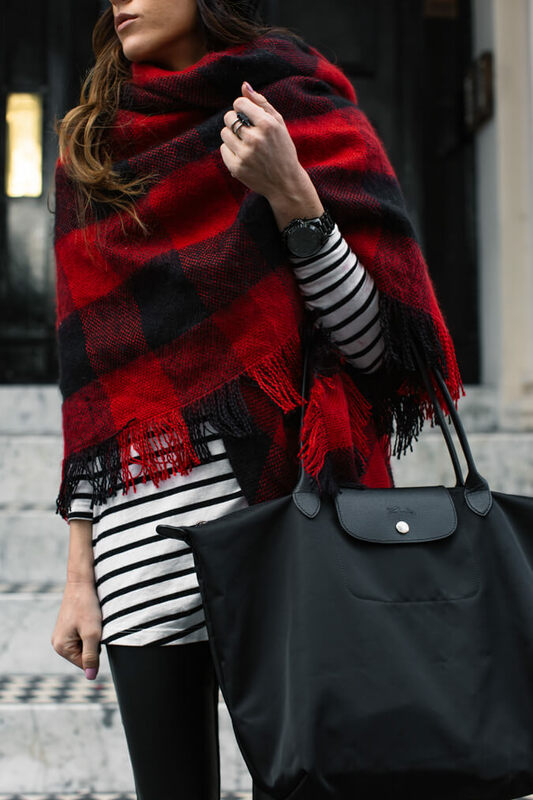 Plaid scarves are a must have, both in classic red/black and in different colors such as orangey or fuchsia nuances. In mid-seasons can also be used as a coat itself, to make yourself warmer in the transition from day to night. It is also an extremely easy to do, just throw the scarf on your shoulders and try to cover as much as possible on the front as well, trying to achieve a “poncho” effect. Bows are always a very nice detail to embellish your outfit with; so why not try to make a bow right on your shoulders or on your chest with your scarf? This look will be perfect if you use colors in contrast, such as a printed scarf on a plain outfit, or a plain scarf on a neutral nuance outfit. Wearing your scarf as a turban might look challenging, but is actually really easy: all you have to do is follow one of the many tutorial you can find on the internet, such as the one we’ll show you at the end of this post. This look is an explosion of colors, and is perfect for special occasions when you really want to stand out from the crowd and look original and particular but yet stylish and elegant. Depending on the occasion, go for basic scarves in plain colors, or choose eccentric patterns to pair with stylish heels and colorful pants or dresses. This look is very casual and easy to pull, but also quite stylish if you plan carefully the different colors and prints you’re going to wear: go for a printed scarf on neutral plain colors, and simply put on your scarf as you would do on a snowman! Just tie your scarf loosely around your neck, and leave the endings on the front of your outfit, for those days in which you don’t feel like caring too much! This style represents a perfect way to wear heavy scarves such as wool ones or blanket ones: it’s again very easy but it also makes sure that you are covered and warm enough during cold winter times. Very casual and street-style inspired, you will just need a very large scarf to simply throw around your neck, and carefully place the ending behind your back. This style works perfectly with big and large scarves in plain colors, either to match with your whole outfit, such as seen in this picture, where nuances are perfectly combined, or you could go for a contrast: for example, wear a plain beige scarf with a burgundy sweater or coat, to keep it stylish yet cozy and casual.